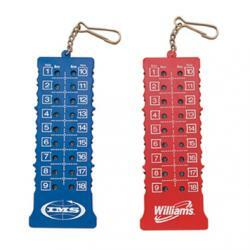 Choose from a wide selection of scoring accessories featuring your company logo or branded message for your next golf tournament, event, outing or promotion. 4. Your scoring accessories will be produced and shipped followed by a tracking number sent by email. Gauge distance. Reticle scale shows markings in meters or yards. Magnification: 8 x 20mm (power x object diameter). Field of view: 131m at 1,000m. Includes protective Slazenger™ case, lens cleaning cloth and instructions. 3.5" H x 1.25" L.. Affordable Golf Record Books - Golf Tournament Gifts.. Custom Logo Individual Golf Score Counter. Records the Score of Each Hole Individually. Conveniently you can clip to your waist, clip to your golf bag, carry in your pocket or store in your golf bag.. Custom Logo Premium Golf Digital Distance Finder. Pocket-size golf scope quickly and accurately measures your distance to the hole. Features 7x magnification with 462-ft field of view at 1,000 yds. With a full view of the flag stick, just align the digita.. Custom Logo Promotional Golf Scopes - Monocular. Drop your handicap a few points by accurately reading the distance from the ball to the pin with this 10x magnification monocular golf scope. Just align the pin to the preset lines in the scope and the dist..
Personalized Golf Score Counters - Golf Tournament Gifts..